As our culture continues to grow more efficient and fast paced, it is vital to integrate a mindfulness practice into our daily lives. 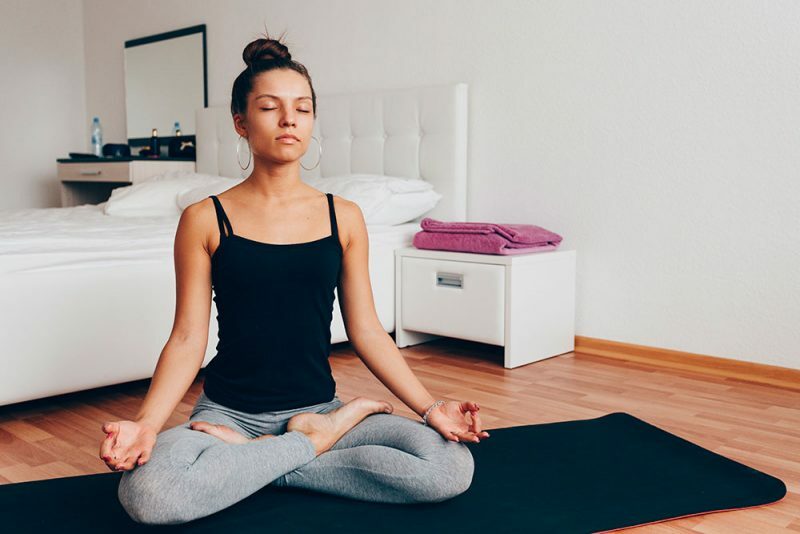 We all want a more convenient way to workout and meditate, which is why doing yoga in your own home can be a wonderful way to supplement your self-care journey. No matter what your lifestyle is or how big your home might be, you can create your own sanctuary space right now! Here are 15 tips on how to do yoga at home and make it a part of your everyday routine. Why do I want to do yoga? How many times per week can I commit to this practice? What am I will to shift in my life to fulfill my intention? Once you are clear with yourself about your intention, write it down. You can even use a sticky note and paste it on your wall to remind yourself of your goal. If your goals change over time, that is okay too. Continue to check in with yourself and follow your inner guidance. Dedicate a section of your home to yoga and meditation. If you have an extra room in your house, convert it into a mini studio! If you do not have the luxury of open space, all you really need is enough room for your body and a mat. You can still make any small space an oasis. Ensure that your room or area is relatively uncluttered and quiet. Treat this area as an escape for your mental and emotional wellbeing. If you are a minimalist, your mat might be enough. Otherwise, you can decorate your walls with yoga art, create an altar to display inspiring objects, and add a plant or water feature. Temperature is important, too. Yoga is best suited for a temperate or warm climate. When you set your intention, create a schedule that you can commit to. If you have a consistent schedule throughout the week, set aside a specific time slot and write this down in your calendar. Practicing at the same time on the same days, if possible, will help make this routine a habit you can stick to. 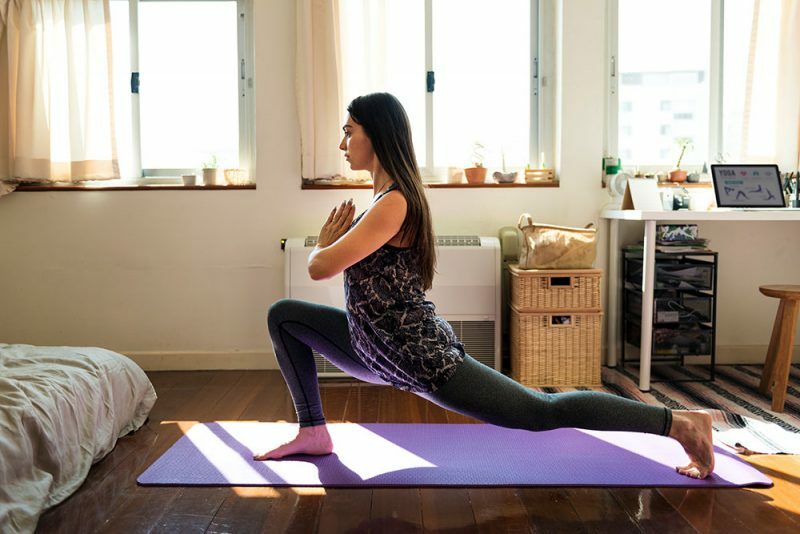 Whether you attend a home session once a week or every day, treat your home yoga practice as an appointment with yourself! If you feel your intention is too ambitious and you are unable to schedule a daily practice, start with baby steps. Once a week is a good start for most people, but commit to at least that to make yoga a priority in your life! Even though you are focused on setting up a home space, you may benefit from attending a yoga class or two. If you have never been to a yoga class, choose something at a beginner level. This will help you build the foundations for a solid practice. Go to a vinyasa, hatha, or restorative class to start. For a thrifty option, do research in your local area for donation based classes or community yoga meetups. You can also gather a group of yogi friends to practice in the park or at a local recreation center. There are so many tutorials and instructables online that you truly don’t have to leave your home to take a yoga class. Some options require payment, while others are free. Any instructor should always discuss safety and provide you with cues for how to adjust a posture. If you are trying advanced asanas like arm balances and headstands, it is advisable to have someone spot you at first. Find what works for you and explore different instructors, class times, and styles. If you feel that you have a solid practice and your body has great muscle memory, use yoga cards as your class. Instead of using an instructor to tell you what to do next, this involves listening to your body more closely. What do I notice about my body today? What is happening in my mind? Has anything changed since I started practicing at home? Keep your answers succinct and try not to tell a story. Strive for just the truth to be your only narrative. An integral part of yoga is meditation. The process of being still can be challenging at home though, especially if there is a lot going on around you. Lucky for you, you have created a lovely retreat for just this reason! Find a time to meditate when you have no distractions. This can be at 6am before you begin the day, in the middle of the afternoon, or even right before bed. Begin with a simple mantra meditation to center your mind. Repeat this word or phrase to yourself in a natural and rhythmic inner voice. If you prefer to be instructed, choose a guided meditation instead. Take at least 20 minutes for any meditation practice before, during or after your asana practice. Savasana is just as important as all the other postures! Do corpse pose at the end of every yoga class to integrate your practice. By entering a relaxed state and withdrawing the senses, our bodies are most open to receiving posture benefits. Take at least 5 minutes to lay down on your back on the mat. Place a bolster or pillow under the knees for lumbar support. Inhale deeply through the nose and exhale through the mouth to release tension in the body and mind. Let everything go and just enjoy the relaxation! Pranayama is the practice of breath, and it is the foundational asana in yoga. Prana, the life force, unites the body and mind. Any posture sequence requires intentional inhales and exhales throughout. 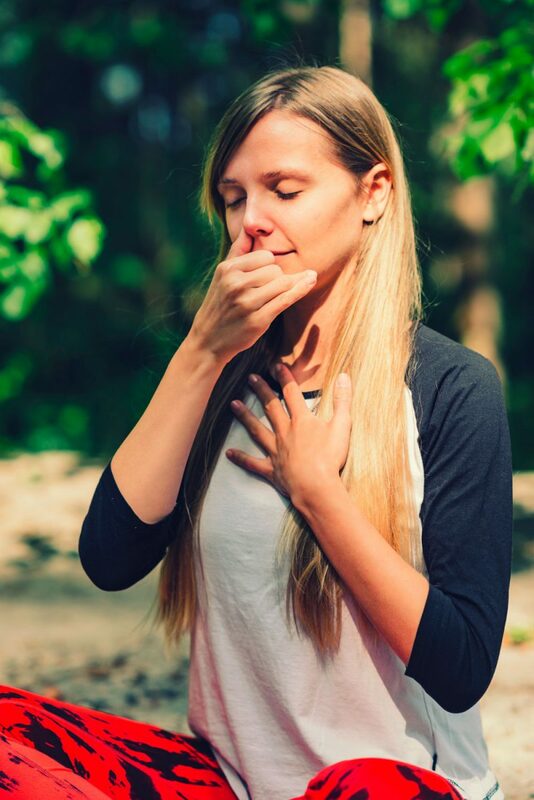 Practice three-part breath, or dirga pranayama, at the beginning of a yoga class. It opens up all areas of the lungs, increasing the flow of oxygen in the body. Utilize this breath during class to deepen your asanas. Depending on the nature of your home session, music can play a big role in your mood and focus. Go with an upbeat mix for a vinyasa flow class. For a more restorative and gentle practice, flutes and acoustics, singing bowls, and nature sounds often calm the body and mind. During meditation or savasana, choose a mantra soundtrack. Many instructional videos often contain background music to complement the instructor’s guidance. You may find that you prefer a musicless class, in which case let your breath be the sound you focus on the most! While doing yoga at home, you may need to use a laptop, television, or tablet to watch online yoga classes. Otherwise, make a commitment to unplug from the rest of your devices. Turn off your phone or put the ringer on silent for the entire class. Preferably, leave your phone outside of the yoga space. You are dedicating this block of time to your well-being! At the end of your yoga class, try not to go straight for your messages or social media. Leave the television off, and go outside instead. Walk on the grass in your bare feet if you can. In reconnecting with nature you may find a newfound sense of inner peace. Before you start a new yoga routine, take inventory of your body. If you have any injuries, be mindful not to engage in postures that could potentially cause more harm. Yoga can test your physical boundaries, but it should never cause pain. If you feel pain, back off immediately and return to a position that feels comfortable. For any aspiring ashtanga yogis, these poses can be challenging and they take a lot of practice. It is totally normal to lose your balance, but keep in mind your space around you! If you are practicing any new postures, do it on a soft surface and preferably with a person supporting you. Of course, you will need a yoga mat. Choose one that feels comfortable and has good grip, along with any colors or styles you like. You also may want to purchase yoga blocks. These are important for any balancing postures or inversions where you need a support under your spine. For a restorative practice, purchase a yoga bolster to place under the knees in savasana. It can also be used as a prop for other gentle postures. If you have a firm pillow, this can work instead. During savasana you may need a blanket since the body cools down after activity. If you have a rigorous practice that makes you sweat, a yoga towel is a must! For deeper stretching, a strap is a great tool to supplement your workout. Depending on your intention, different styles may suit your wellness needs. Any yoga newbie should always begin with a hatha foundations practice. Hatha is the style that all others are based off of. It will provide you with how to perform postures correctly and safely. If your goal is fitness, any vinyasa, ashtanga or bikram practice acts as resistance training for the body, while you get a cardiovascular workout. Some of these practices utilize heat to loosen and detox the body, so add a space heater to your area for extra warmth! Other more gentle options include deep stretching, restorative/yin, and yoga nidra. Try out different styles to see which ones you vibe with the most. Yoga doesn’t just happen on your mat. It is really a way of life! When we practice, we become quiet, centered, and mindful. The yamas and niyamas are yoga’s ethical guideline to life. For a deep off the mat practice, take on a different one per week. You may even notice how your yoga practice on the mat changes, too. To practice mindfulness in your daily life, treat every simple action with respect and compassion. Through this lens, you become more aware of yourself and the profound connection to everything around you. When in doubt, be kind. 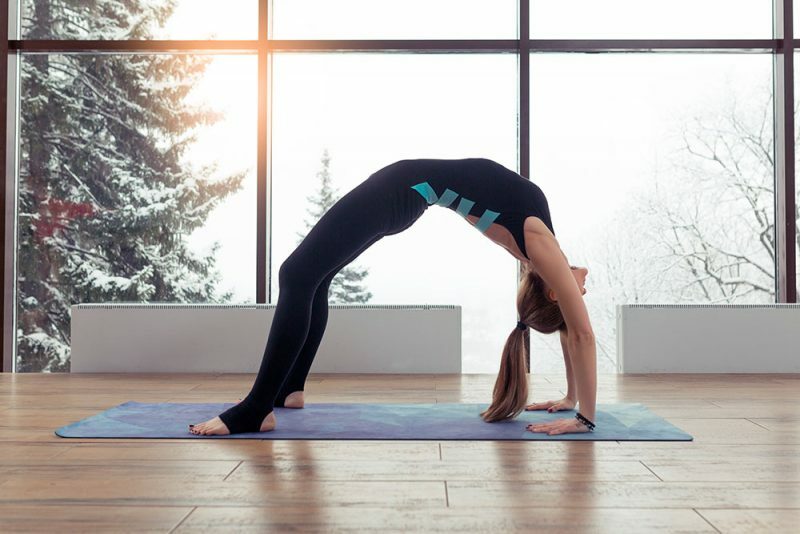 Starting a home yoga practice is a beautiful way to connect the body and mind. When beginning any new project, give yourself time to plan and adjust. The best part is, you don’t have to leave the comfort of your own space to transform yourself. By integrating these helpful tips into your home class, you can create a positive routine that you can hold yourself to and be proud of. You may even inspire others to follow in your footsteps or to be more compassionate with their own wellbeing. By taking care of yourself, you are doing good for the world. It all begins with you!